A biopic of an iconic American figure directed by a Chilean filmmaker—making his English-language debut—and filmed mostly in Paris with a French crew, Jackie is a stirring and enlightening yet wholly unconventional portrait of the former first lady. A sensational Natalie Portman stars in the performance of her life as Jacqueline Bouvier Kennedy in the immediate period before and after the assassination of her husband, President John F. Kennedy. Director Pablo Larraín and screenwriter Noah Oppenheim bring a fresh perspective to the well-worn, real-life tragedy and frames Kennedy as a fully-formed figure beyond her highly constructed public image. Jackie Kennedy, the character, makes the canny case for preserving and establishing JFK's short but undeniable presidential legacy in aftermath of his death while still in a state of shell shock. The film both glamorizes and deconstructs the myth of Camelot and the Kennedy presidency full of hope and tragedy continued long after JFK's short life. Larraín and producer Darren Aronofsky—who directed Portman's Oscar-winning performance in Black Swan—populate the supporting cast with quiet all-stars. Most figure only as supplements to Portman's staggeringly unrestrained portrayal aside from Peter Sarsgaard's grief-striken, but tempered role as brother-in-law Bobby Kennedy. Greta Gerwig as Jackie's confidant, John Carroll Lynch as LBJ, and Max Cassell as White House staffer Jack Valenti flesh out the ideals of Kennedy and her use of power once she becomes the world's most famous widow. 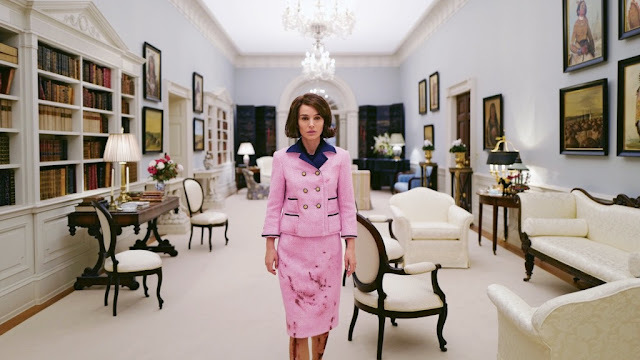 The film is framed through Kennedy's interview with Life journalist Theodore White (played by Billy Crudup) a week after the assasination and this is how Portman reveals and unravels the artifice and image of Jackie Kennedy as a work of and for the American public alongside recreations of her famous televised tour of the White House. Filmed in grainy Super 16mm film, the period detail makes the film incredibly immersive yet timely echoed by Under the Skin composer Mica Levi's hauntingly brilliant musical score. Jackie is an intimate, experimental art film, shot mostly in close-ups, about recent American history and is a stunning marriage of acting, composition, and emotion. Larraín, by recreating the famous events and fictionalizing the private conversations around them through famous historical faces, makes the case for how the American public's perception of power and beauty framed these individuals through tragedy. Portman's duelling roles of a public and private figure are an astonishing work of dramatic acting.